Packers wide receiver Donald Driver has been a fan-favorite in Green Bay (and pretty much the entire state of Wisconsin) for over a decade now. But he recently acquired an entirely new national fanbase by winning Season 14 of ABC’s Dancing with the Stars, beating out Katherine Jenkins and William Levy (neither of whom I have ever heard of) for the coveted Mirror Ball Trophy. No word yet on what the DWTS championship ring will look like, but I’m sure Donald will wear it proudly right next to his Super Bowl ring. Anyway, like I said, Driver’s successful stint on America’s premier celebrity ballroom dancing television show has gained him a lot of new fans. Some of them were among the 8,745 in attendance on Sunday at his annual charity softball game in Appleton, WI. And it turns out that these new fans are just as crazy about Donald Driver as the old ones—if not more so. You see, after the game, long after all the other players had headed to the clubhouse, Driver stayed on the field signing autographs. Then, when he did finally head to the clubhouse, he started throwing all of his gear to adoring fans. 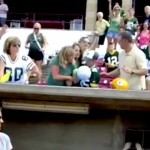 One such adoring fan was a little boy in a Packers jersey. And when the youngster called out to Driver, the wide receiver immediately took off one of his shoes and threw it to him. It was really a sweet moment…you know, until the totally well-adjusted, not-at-all-obsessed grown woman carrying the homemade DWTS Mirror Ball Trophy ripped the shoe right out of the little boy’s hands.